The point of this short blog series is simple. (Read Part 1: Mark and Part 2: Matthew.) Some Christians, whether they be theologically conservative or liberal, don’t see the Old Testament (OT) as important or relevant. So, we decided to see how Jesus thought of the OT. If you read the first two parts of this series on Mark and Matthew, I think you’re beginning to see a pattern here: throughout the Gospels, the OT is referred to constantly, and much of those references are made by Jesus himself. Keep in mind this a quick count done in one reading of John’s Gospel and does not include the numerous times Jesus refers to himself as the “Son of Man,” which is an OT reference to Daniel 7 (which he does 12 times in John’s Gospel). Compared to the other two Gospels we looked at so far, John has the smallest percentage of OT references made by Jesus of the OT references. In Mark, Jesus makes 83% of the OT references, and in Matthew, Jesus makes 68% of the OT references. Yet, Jesus’ 24 references compared to 21 chapters gives us a rough idea that Jesus made such references regularly in John’s Gospel. And, with this, as you’ll see below, quantity does not effect quality. As most know, John includes a lot of material the other three Gospels do not. Yet, in John, we find more of the same that we found in Mark and Matthew. As in the other Gospels, in John there are many OT references made by both the writer of the Gospel (John) and Jesus himself (and even by other people who appear in the narratives). 39 You search the Scriptures because you think that in them you have eternal life; and it is they that bear witness about me, 40 yet you refuse to come to me that you may have life… There is one who accuses you: Moses, on whom you have set your hope. 46 For if you believed Moses, you would believe me; for he wrote of me. 47 But if you do not believe his writings, how will you believe my words?”… 14 When the people saw the sign that he had done, they said, “This is indeed the Prophet who is to come into the world!” (John 5:39–6:14). Here, Jesus plainly states that the OT bears witness about him and that Moses wrote of him. Some of the people listening to him understand Jesus to be “the Prophet who is to come,” which could only be a reference to Deuteronomy 18:15-22, where God promises to Moses to rise up in Israel another prophet. John begins his Gospel with a prologue that tells us right away that Jesus is God (1:1) and became a man (1:14). After the prologue, John goes on to show this with the narrative of Jesus’ ministry, death, and resurrection. One way John does this is giving us many times Jesus refers to himself as “I AM.” Some of these in English are translated as “I am he” or even “it is I,” which are acceptable translations, but if you look at the original Greek, they are all written in the same way: “Ego Eimi” (“I AM”). But this is most clearly seen throughout John 8. Jesus states, “…unless you believe that I AM you will die in your sins” (8:24). 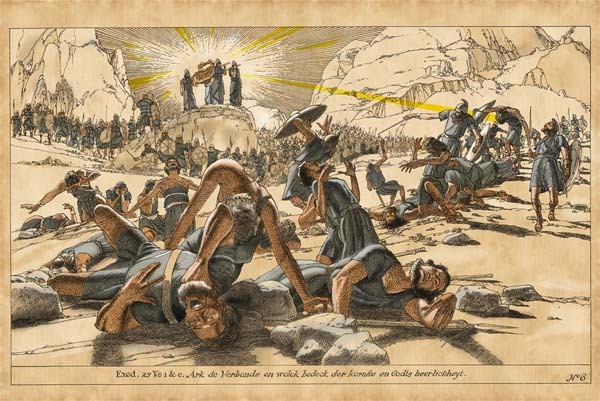 He goes on to say that when he is “lifted up” (which may be a reference to him being lifted up on the cross, his ascension into heaven, or him being lifted up in glory, or all of them – which is how I understand it because they are all related) that his audience “will then know that I AM” (8:28). And if you think I’m stretching it here to prove my point, the people listening to Jesus in his day don’t think so because in 8:58, Jesus makes the grammatically-odd statement “before Abraham was, I AM.” Jesus’ listeners finally get it: This guy is calling himself the God who appeared to Moses! And that’s blasphemy! So, they pick up stones to stone him to death (8:59). Thus, one of the ways Jesus communicated to his fellow Jews that he was God-in-the-flesh was by referring to their holy writings – what we call the OT. 38 [Jesus said,] Whoever believes in me, as the Scripture has said, ‘Out of his heart will flow rivers of living water.’ ” 39 Now this he said about the Spirit, whom those who believed in him were to receive, for as yet the Spirit had not been given, because Jesus was not yet glorified. (John 7:38–39). So, John 1:1 establishes that the Father and Son are both God, and here we find that the Holy Spirit is also God. Thus, we find the Trinity – three unique personalities sharing one divine identity. All of this is good stuff to point our to Jehovah’s Witnesses, who deny the Trinity. Let me point out one last interesting passage; though we are primarily concerned with the OT references made by Jesus himself in John’s Gospel, this last one – made by the author, John, one of the original twelve disciples of Jesus, is worth noting. And the foundations of the thresholds shook at the voice of him who called, and the house was filled with smoke. And I said: “Woe is me! For I am lost; for I am a man of unclean lips, and I dwell in the midst of a people of unclean lips; for my eyes have seen the King, the Lord of hosts!” (6:1–5). Thus, in this vision of God – Yahweh, I AM, the Lord of hosts – Isaiah saw Jesus’ glory. NEXT: Final of the series: LUKE’S GOSPEL. The concept of this short blog series is simple: We’re simply asking, Is the Old Testament relevant to the Christian faith? and then reading through the Gospels and seeing what Jesus’ attitude towards the Old Testament tells us. 18 References to the Old Testament (OT). 15 of those references to OT were made by Jesus. Thus, 83% of OT references in Mark are made by Jesus. This time, with the Gospel of Matthew, again we read and counted OT references, excluding again many of the times Jesus calls himself the Son of Man, which is an OT reference. Matthew has 28 chapters – noting that these chapters are not part of the original text but give us a rough idea of a Gospel’s length compared to the other Gospels. I counted 65 references to the OT. Matthew’s Gospel, the most Jewish of the Gospels, has the major theme of Jesus being the Jewish Messiah; thus, it’s not surprising that the author, Matthew, includes many references to the OT, especially in the first three chapters, to support this idea. Yet, again, like Mark’s Gospel, we find the majority of OT quotes and references – 44 of them – belong to Jesus. This means Jesus makes 68% of the OT references in the Gospel of Matthew. In these references, Jesus speaks of Solomon, Moses, Abraham, Isaac, Jacob, David, Sodom and Gomorrah, Elijah, Jonah, Isaiah, the Ten Commandments, Abel, Zechariah, Daniel, and Noah and the Flood. He quotes from the books of the Psalms, Deuteronomy, Zechariah, and others. We’ll start was a popular episode, which is also recorded in Luke but only briefly summarized in Mark: Satan’s temptation of Jesus in the wilderness. We’re told of three ways the Devil tried to temp Jesus to sin, and all three times Jesus shuts Satan down by stating “It is written…” and then quoting from the OT book of Deuteronomy. This is something we see all the time: someone rips a quote from Scripture out of context for his own selfish gain. Jesus, thus, models for us how to respond: by properly using Scripture, by understanding and using it in its proper context! For Christians today, “every word” from the mouth of God includes both the New and Old Testament. 17 “Do not think that I have come to abolish the Law or the Prophets; I have not come to abolish them but to fulfill them. 18 For truly, I say to you, until heaven and earth pass away, not an iota, not a dot, will pass from the Law until all is accomplished. 19 Therefore whoever relaxes one of the least of these commandments and teaches others to do the same will be called least in the kingdom of heaven, but whoever does them and teaches them will be called great in the kingdom of heaven. The phrase “The Law and the Prophets” is often how Jesus and others in his day referred to what we call the OT. If there is one big idea from this passage that can’t be ignored, it’s that Jesus is explicitly teaching that the OT is NOT irreverent – “not an iota, not a dot”! How much more clear can Jesus be? But this leads us into a theological question (which we also addressed in other blogs): Why do Christians follow some of the OT commands and not other? Jesus gives us the answer above: became he came to fulfill the OT. How? Through his life in perfect obedience to it and his atoning death on the cross. Because of this, Christians no longer make sacrifices or follow other OT religious laws, which all point forward to the Christ’s atoning sacrifice, yet Christians still do follow the OT moral law, because morality is based in the nature of God and God’s nature doesn’t change. 33 “Again you have heard that it was said to those of old, ‘You shall not swear falsely… 34 But I say to you, Do not take an oath at all… 37 Let what you say be simply ‘Yes’ or ‘No’; anything more than this comes from evil. 38 “You have heard that it was said, ‘An eye for an eye and a tooth for a tooth.’ 39 But I say to you, Do not resist the one who is evil…. In each of these, Jesus is first referring to a passage in the OT (“You have heard..”) and then drawing out its deeper significance (“But I say to you…”) or citing a misunderstanding or abuse of an OT passage and correcting it. Take note, by saying “I say to you” Jesus is not speaking as a prophet speaking on behalf of God but as God himself. By doing this, Jesus is showing the importance of studying the OT and understanding it correctly. Interestingly, Jesus is summing up the whole of the OT (“the Law and the Prophets”) in a terse command. It’s interesting that many believe there is a disconnect between the “harshness” of the OT and the teachings of Jesus, yet Jesus himself affirms again and again that his teachings are simply a continuation (and fulfillment) of the OT. 29 “Woe to you, scribes and Pharisees, hypocrites! … 34 Therefore I send you prophets and wise men and scribes, some of whom you will kill and crucify, and some you will flog in your synagogues and persecute from town to town, 35 so that on you may come all the righteous blood shed on earth, from the blood of righteous Abel to the blood of Zechariah the son of Barachiah, whom you murdered between the sanctuary and the altar. 36 Truly, I say to you, all these things will come upon this generation. This is one of those passages that I would’ve never picked up the significance of if someone hadn’t pointed it out to me. Here, Jesus condemns the religious hypocrites of his day with those hypocrites that came before them, who claimed to be godly people but persecuted and killed the prophets and other righteous men of God starting with Abel all the way to Zechariah. The fact that Jesus says from Abel to Zechariah is profound. As many know, Abel was the first victim of murder in history. He was devoted to the LORD and a son of Adam and Eve, but his brother Cain, in jealousy and rage, murdered him (Genesis 4:8-11). Zechariah, too, was righteous and murdered (2 Chronicles 24:20-22). Abel (in Genesis) is the first person murdered and Zechariah (in Chronicles) is the last person murdered within the Hebrew canon of Scripture. By saying from Abel to Zechariah, Jesus is basically saying from Genesis (first book) or Chronicles (last book) of the Jewish Scripture. Thus, Jesus confirmed all the books of the OT – from the first book to the last. Recently, megachurch pastor Andy Stanley has received a lot of pushback from the Christian community for telling Christians to “unhitch” their faith from the OT: “[First century] Church leaders unhitched the church from the worldview, value system, and regulations of the Jewish scriptures,” said Stanley. I wasn’t a Christian long when I realized I preferred to spend my time of Bible study in the New Testament (NT) rather than the Old Testament (OT), which isn’t surprising. After all, we call ourselves Christians because of Jesus Christ, so it’s natural to want to spend more time in his teachings and the letters of his disciples in the NT. With this, the OT is much more ancient, longer, and more difficult to grasp than the NT. Frankly, many Christians don’t know what to make of much of the OT and when considering challenging issues concerning the Bible, many Christians find themselves wishing the OT simply wasn’t there. Where Stanley still claims the OT is the inspired word of God, those who hold a less-traditional view of Scripture assign the OT lesser status than the NT, some even dismissing much (or all) of the OT as not part God’s divine Word. In fact, many – whether they realize it or not – chop up the Bible and create a hierarchy of biblical authority. According to this thinking, the four Gospels – and particularly Jesus’ actual words in those Gospels – are more authoritative than both the OT and other NT writings. The church’s traditional, historical view of the Bible is that it’s all God’s Word. Whether it’s Moses’ words, Jeremiah’s words, Matthew’s words, Paul’s words, or Jesus’ words, it’s all “God-breathed” (2 Tim. 3:16) and holds the same level of authority: the authority of God. But the fact remains, many Christians do their best to simply avoid the OT. Yet, the longer I study the Bible, the more I have realized that one cannot make sense of the NT without the OT (and vice versa). The Bible is not two separate, unrelated revelations of God, but one continuing revelation. The OT is important for all Christians to wrestle with and gain a better understanding of, and I want my brothers and sisters in Christ to understand this. So, to get this point across, I will NOT be arguing for a traditional view of Scripture or explaining why the canon is divinely-inspired or laying out biblical theology so one sees the logical connection between the OT and NT. No, we’re simply going to look at Jesus’ attitude towards the OT. We’ll work through one gospel per article, starting with Mark. I think you’ll see that Jesus’ thinking and theology are all perfectly in line with the OT and that Jesus considered what we call the OT anything but irrelevant. I decided to start with the Gospel of Mark for one simple reason: it’s easily the shortest of the four. How much will Jesus refer to the OT in it? Mark contains 16 “chapters.” As I read through, I simply jotted down every reference to the OT I came across (excluding most of the times Jesus refers to himself as “the Son of Man,” though this is a title adopted from the OT). Though chapters were not part of the original manuscripts, they give us a rough idea of the length of each Gospel as compared to the others. I counted 18 OT references. Of these, 15 were said by Jesus himself. So, all but 3 came from Jesus’ mouth. Thus, 83% of OT references, allusions, and quotes in Mark’s Gospel are Jesus’ words. 2 And Pharisees came up and in order to test him asked, “Is it lawful for a man to divorce his wife?” 3 He answered them, “What did Moses command you?” 4 They said, “Moses allowed a man to write a certificate of divorce and to send her away.” 5 And Jesus said to them, “Because of your hardness of heart he wrote you this commandment. 6 But from the beginning of creation, ‘God made them male and female.’ 7 ‘Therefore a man shall leave his father and mother and hold fast to his wife, 8 and the two shall become one flesh.’ So they are no longer two but one flesh. 9 What therefore God has joined together, let not man separate.” (Mark 10:2–9). When questioned about divorce, Jesus without hesitating points his opponents to the Jewish Scripture (what we call the OT). Not only does he refer back to the creation story in Genesis 1-2, but he quotes directly from it (while indirectly referring to Adam and Eve). With this, Jesus refers directly to Moses (and his writings on divorce in Deuteronomy 24:1-4). It’s interesting to note that Jesus clearly teaches that not all OT commandments by Moses are universal. (For a more on why certain OT commandments are still followed by Christians and other are not, click here.) But what is most significant is that Jesus uses Genesis 1-2 – pointing way back to creation before the fall into sin – to give his definition of marriage: one man and one woman becoming “one flesh” for life through God. 24 Jesus said to them, “Is this not the reason you are wrong, because you know neither the Scriptures nor the power of God? 25 For when they rise from the dead, they neither marry nor are given in marriage, but are like angels in heaven. 26 And as for the dead being raised, have you not read in the book of Moses, in the passage about the bush, how God spoke to him, saying, ‘I am the God of Abraham, and the God of Isaac, and the God of Jacob’? 27 He is not God of the dead, but of the living. You are quite wrong.” (Mark 12:24–27). Here, Jesus is challenged by the Sadducees, who don’t believe in the future resurrection of the dead. Again, it’s striking how Jesus immediately refers back to the OT to argue his stance, even chastising them for not knowing Scripture and plainly telling them “you are wrong.” Once again, he refers to Moses, mentioning specifically Moses’ encounter with God at the burning bush in Exodus 3, as well as Abraham, Isaac, and Jacob from Genesis. But what is most interesting is that Jesus bases his whole argument on the tense of a single verb! As proof of a future resurrection, Jesus quotes God’s words to Moses at the burning bush: “I am the God of Abraham…Isaac… Jacob.” From a human standpoint, Abraham, Isaac, and Jacob were long dead at the time of Moses’ life, yet God is – not was – their God. Jesus is using the present tense Hebrew word for am to prove that Abraham, Isaac, and Jacob are still experiencing life with God. To those on earth, Abraham, Isaac, and Jacob were gone, but Jesus says it’s not so; God is still their God because they still live. What kind of confidence in the authority and preservation of the OT must Jesus have to base his whole argument of the tense of one verb? This passage is important because it shows Jesus’ understanding of the continuity of the OT and NT. Many Christians shy away from the OT because, they think, its teachings do not fit well into NT teachings. Jesus clearly doesn’t think there’s any disconnect between the OT and NT. Jesus quotes from Deuteronomy 6:4-5 and Leviticus 19:18; thus, the greatest commandments, according to Jesus, come from the OT. As I said above, the OT and NT are one continuos revelation from God. This should motivate us all to work for a better understanding of the OT. Yes, some of it seems strange and harsh to us, but Jesus did not think so. 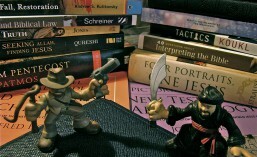 This should motivate us to wrestle with the tough passages to understand them as Jesus did. I love this passage because, again, we see Jesus using the specific wording of an OT passage to astound his listeners. This is also significant not only because Jesus quotes Psalm 110 and confirms David as the author, but also Jesus states that David wrote this by the power of the Holy Spirit. Jesus basically asks, if the Messiah will be David’s descendant (“son”), how can the great King David call him his Lord? Jesus is dropping a loud hint that the divinely-inspired Psalms are telling them that the Messiah will be much, much greater than King David. 49 Day after day I was with you in the temple teaching, and you did not seize me. But let the Scriptures be fulfilled.” (Mark 14:49). This final passage we’ll look at in this article is from Jesus’ arrest before his crucifixion. Though he doesn’t make a specific reference to an OT passage, he refers to “the Scriptures” – which to a Jew of Jesus’ day could only be what we call the OT today – and that they are being fulfilled through these events. Thus, Jesus says his arrest and execution actually fulfill the OT. One comes to understand through Jesus (and the NT revelation) that the whole of the OT is a foreshadowing and preparation for the coming of the God-man and his atonement for sins by his death on the cross. Where it’s beyond the scope of this article to explore how Christ fulfills the OT law, it’s enough to note here that Jesus in Mark 14:49 (and other places in the Gospels) confirms that he does. Did Jesus consider the Old Testament relevant? He clearly did. 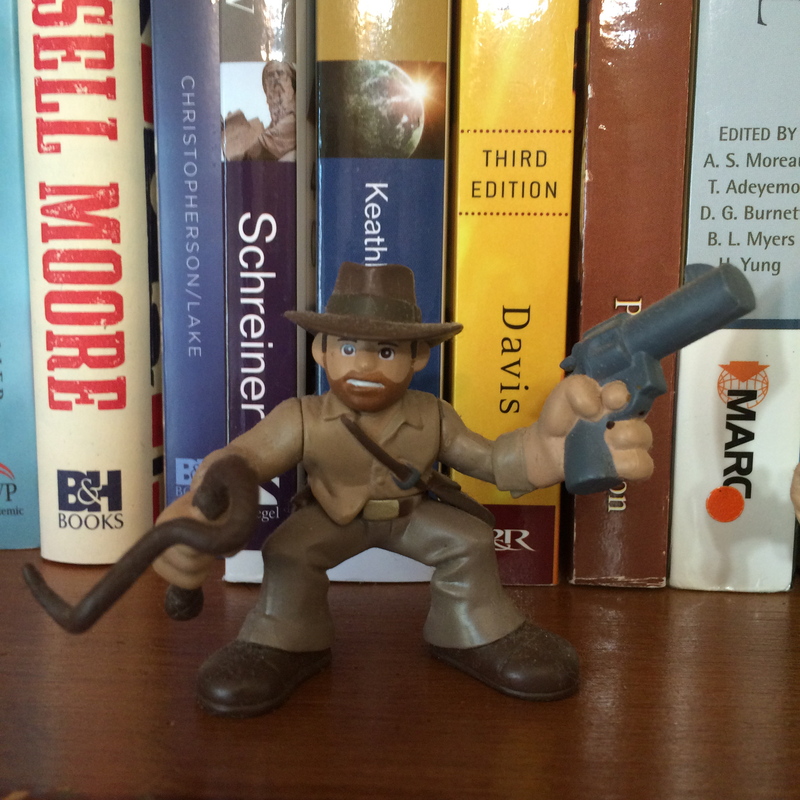 Indiana Jones, the Lost Ark & the Temple of Blog (Part 1) What’s a Covenant? From time-to-time, we at GFTM like to interact with popular movies, TV, and culture, such as in our previous articles about Breaking Bad and The Walking Dead. 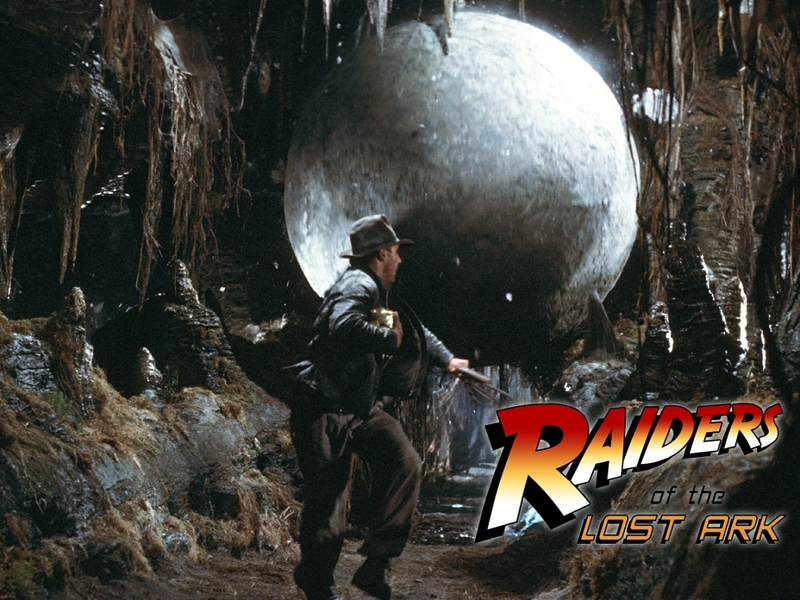 In this series, I wanted to interact with a classic from my childhood, one of my all-time favorite movies, and easily one of the greatest action/adventure movies ever made: Raiders of the Lost Ark. (Watch the 1981 trailer here.) Having watched it again recently, I couldn’t resist. EVER GO TO SUNDAY SCHOOL? 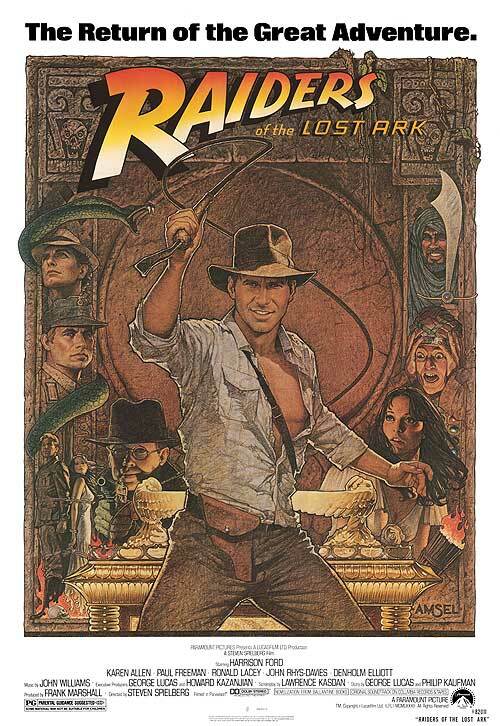 In the movie, Indiana Jones – professor of archeology, expert on the occult, “obtainer of rare antiquities,” and “man of many talents” – is commissioned by U.S. army intelligence agents to find the lost Ark of the Covenant before the Nazis do. Apparently, Hitler had a thing for finding supernatural artifacts, and he believed that by possessing the Ark, his Nazi army would be unstoppable. Frankly, Hitler had bad theology. But we’ll get into that later. In Indy’s meeting with the army intelligence agents, we’re given the back-story of the Ark. (Watch the conversation here.) We’re told the Ark contains “thee” 10 Commandments, the actual stone tablets carried down from Mount Sinai by Moses, “if you believe in that sort of thing.” The Ark was carried by the ancient Israelites into battle, and it was kept in the Temple of Solomon in Jerusalem. But then is disappeared from history. Brody says, “The Bible speaks of the Ark leveling mountains and laying waste to entire regions. The army that carries the Ark before it is invincible.” This is not something we wanted Hitler to get his hands on. But how well does what Indy and Brody say about the Ark line up with the Bible? In this series, we’ll be looking at what the Bible tells us about the lost Ark, even what the Bible tells us about some raiders of the Ark. We won’t be talking about The Temple of Doom, but you’ll learn about the Temple of God in Jerusalem where the Ark was kept. We won’t discuss the Last Crusade, but you’ll learn about Israel’s crusade into the Promised Land with the Ark. And we certainly won’t be talking about The Kingdom of the Crystal Skull, but hopefully you’ll learn something about the Kingdom of God. SO, WHAT’S ALL THIS OLD TESTAMENT STUFF ABOUT? SO, WHERE DID THE ARK GO? WAIT, FIRST, WHAT’S A COVENANT? Why is the Ark called the Ark of the Covenant? What’s a covenant? And what is THE Covenant? Before we even talk about the Ark itself, these would be helpful questions to answer. Essentially, a covenant is a sort of binding agreement – similar to a vow or contract – between two or more parties. Sometimes it’s one of mutual obligation, but it can also be a one-sided obligation. Often covenants were made between a king and a group of people. Marriage can be also considered a covenantal relationship both on a personal and legal level. Long before Moses and the exodus from Egypt, God called upon Abraham (Abram at the time), the forefather of Moses and the Israelites, and made a covenant with him. Sometimes, God would remind his people of these covenant promises or renew them or even make new ones. And after freeing Israel from slavery, God made a new covenant with Israel. This one was one of mutual obligation: God will protect Israel and bless them, and Israel would be loyal to God, being his representative people on earth, and live by his guidance and law (See Exodus 19-24). To seal the covenant, Moses “took the Book of the Covenant and read it in the hearing of the people. And they said, ‘All that the Lord has spoken we will do, and we will be obedient.’ And Moses took the blood [of the peace offerings] and threw it on the people and said, ‘Behold the blood of the covenant that the Lord has made with you in accordance with all these words’” (Exodus 24:7-8). (1) Now, the thing with mutual obligation covenants is if one party doesn’t keep up their end of the agreement, the contract is null and void. As you’ll see later, Israel didn’t uphold their side of the contract. (2) In the New Testament, Jesus took up a cup during the Last Supper on the night before he was crucified and said, “This cup that is poured out for you is the new covenant in my blood” (Luke 22:20). But we’ll talk more about both these things later. NEXT: What is the Ark? by James M. Hamilton Jr.
Dr. Hamilton opened his sermon with an illustration from a Shakespeare play — and not one of Shakespeare’s more popular ones. Later in the sermon, he quoted John Gardener, a writer’s writer, author of books like Grendel and The Art of Fiction. Having a B.A. in English myself, I concluded Dr. Hamilton must have an English/literature background. Later, I found out I was correct. 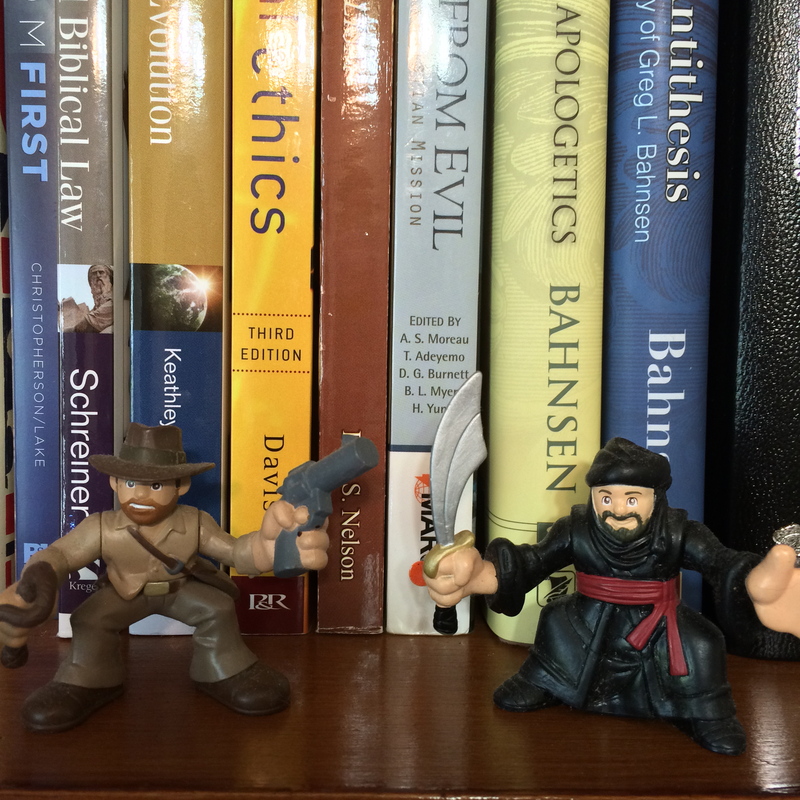 Maybe I’m a bit biased, but I do believe having a background in literature gives a biblical scholar a unique advantage. The Bible, after all, is a work of literature. Not only is it a collection of various genres of literature, many of the more poetic parts is abound with figurative language. Further, even the histories use literary devices to tell history as narrative. James Hamilton is the right man for writing a book like this. Biblical theology is the study of the story of the Bible as a whole. Many of us grew up hearing stories from the Bible, thinking that the Bible is just a collection of random, unconnected stories. Yet there is one overarching story-line that continues throughout the whole Bible. In order to better understand this metanarrative, one must see the connection between the themes, symbols, and patterns (typology) of the Bible. Again, call me biased, but I believe someone with a literature background is best qualified to do this. We need more books like this: books written by quality scholars who can break down big ideas into readable books for everyday readers. Biblical theology is an important subject for all Christians to be familiar with because it leads to a huge jump in understanding and confidence in their faith. This short, readable book would be ideal for pastors to use to lead a group of laypeople through lessons on the unity of the Bible and the harder-to-grasp concepts like symbolism, theme, and typology (patterns that repeat throughout biblical history and even foreshadow future events). As Dr. Hamilton states, if we don’t understand the symbolism used by the authors, we’ll miss the meanings of the authors’ messages. As an English teacher, I find symbolism is one of the harder concepts for people to grasp, yet the Bible is filled with symbols. 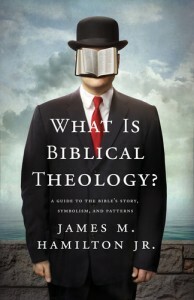 If you pick up What is Biblical Theology? for nothing else, it’s a great explanation of the predominate symbols seen throughout the Bible.